We invite you to take a break from the fuss, as well as to relax and recharge with the sound energy in our cozy studio in the heart of Old Tallinn. This is a special place where live music of archaic instruments plays, the sound of which is not only charming, but also has a healing effect. 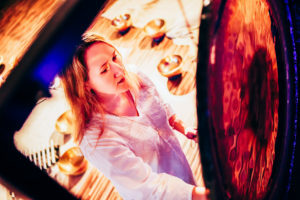 In our collection, there are unusual instruments from all corners of the globe: Tibetan and crystal bowls, Gongs, Australian didgeridoo, ethnic flutes, strings, melodic percussion, and even pianoforte. When lying in a deeply relaxed state, our listeners smoothly sink into sounds, feeling how the sound vibrations penetrate and resonate in their bodies. 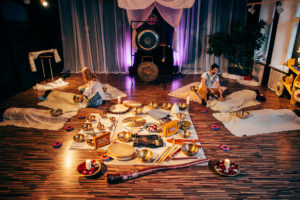 You can take a part in a group sound massage or a sound travel (at a lying down concert), and also you can order a sound massage or a sound therapy session for one or more listeners. We also conduct master classes and training in the sound therapy, voice yoga, and overtone singing. 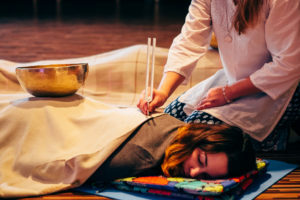 This is a unique method that allows you to get rid of all kinds of stresses and blocks on a physical, emotional and energy levels .This proprietor methodology was developed and supplemented for 4 years, based on the ancient cultures and the sound practices of the East and West. Vibroacoustic massage helps start internal self-healing processes, as there are similar processes in the human body during a sound session to those occurring during a full night rest, as well as the hormonal and nervous systems get restored, and the brain waves slow down to theta and delta levels. With vibroacoustic anti-stress massage, you can significantly improve your state of health, and first of all, level the emotional state, repose and relax. Besides, it is the incomparable pleasure! ✔ The unique Chinese water bowl and live overtone singing create the inimitable atmosphere. 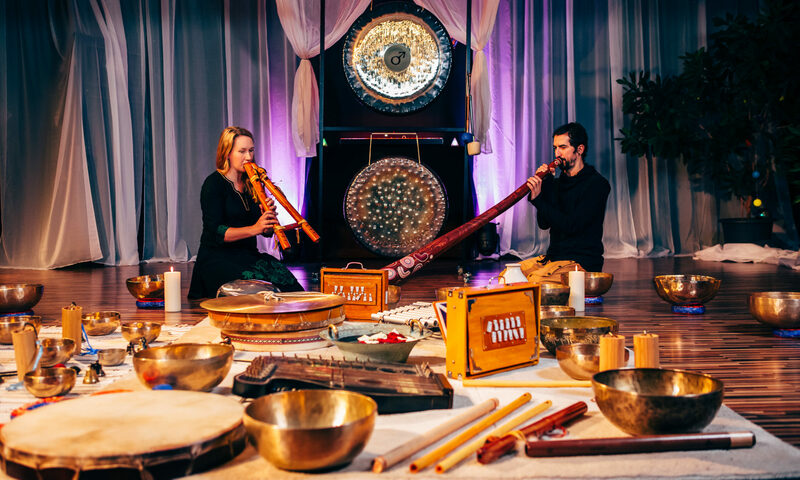 – this is the basic set of instruments that we use at such a concert, which is therefore a session of healing sounds. – Normalizing physiological processes in the body: i.e. blood circulation, breathing, digestion, brain activity, etc. – Giving a healthy and deep sleep. PRICE: €15, payment in cash at site. It is advisable to book places via phones +372 559 30 551, +372 5628 5229 or e-mail info@helid.ee. ADDRESS: in Tallinn Old Town, Uus Street 19 (Enter through the gate on the left, then go straight. The last door on the left leads directly to our hall). Co-founder of Healing Sounds Center in Tallinn, Estonia. Organizer of concerts and seminars. Gong master. A musician, a performer of overtone singing. Certified expert in sound massage. Sound and music therapist. Member of the Music Therapy Union of Estonia (Muusikateraapia ühing) and of the Sound Healers Association of Jonathan Goldman. Sound therapist, Certified specialist in vibroacoustic massage. Member of the Sound Healers Association of Jonathan Goldman. 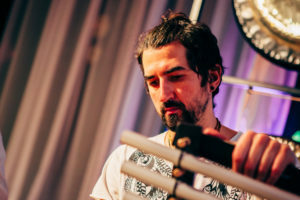 multi-instrumentalist – musician, DJ, and producer. Osteopath of the Saraswati International Academy. Feel free to contact if you want to decorate your event with meditative music or to pass individual sound sessions.